Canadian author Maureen Jennings is a former psychotherapist. She is the author of the Murdoch Mysteries set in Toronto and the DCI Tom Tyler series set in WWII. On the 180th anniversary of the City of Toronto she was named one of the 180 people who have shaped the history of the city. Maureen won the Grant Allen Award, honouring Canada's crime writing pioneers, in 2011. She has also been nominated for numerous awards including: an Anthony, an Arthur Ellis, a Macavity, plus a Barry and a Bruce Alexander. That's some going. 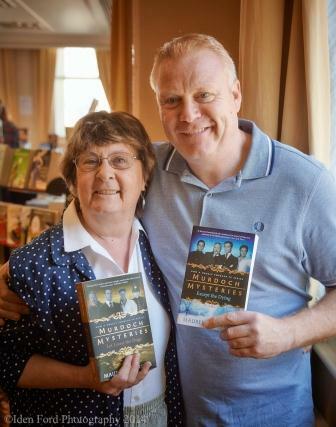 Maureen was a guest at CrimeFest in May 2014. Questions were set by Ayo Onatade but the interview was carried out by Iden Ford (Maureen's husband) - whom we thank. Ayo Onatade: How did Detective Murdoch come about? Was there someone that was a specific inspiration? Maureen Jennings: He was inspired by the real life Canadian Detective John Wilson Murray who was a real life Victorian Canadian Detective. I featured Wilson Murray in two plays and which ultimately morphed the first book, Except the Dying and Beyond. I decided on the name Murdoch because a local Toronto crime fiction reviewer was named Murdoch. It was a little tribute to him. William is from William Shakespeare, my hero. You have two different sets of audiences – firstly those that read your books and then those that watch the programme. How difficult was it to see your books go from book to screen and are you happy with the result? It happened in two stages, first were direct adaptations of three novels to Movies of the Week and they were great, the next stage was a series, which came about as a result of the success of the movies of the week. I do sometimes feel like the mother in law, I birthed and raised him, know him, then he got married and she thinks she knows him better than I do. All in all I am very happy with what the series writers have done with him. How much involvement do you have with the series? I am the “creative consultant” on the series, I see all the scripts and make notes and comments, but it simply means I have an opinion but no vote. I have co written three scripts for the series and this year I am writing my own adaptation for Shipwreck, a novella I wrote a few years back which deals with Murdoch and his awakening interest in detecting as a 12 year old. Tom Craig plays Inspector Brackenfield a long-standing character. How well does he portray Inspector Brackenfield and are you happy in the way he is portrayed? Brackenreid was a real person and was a teetotaller, in the show, Brackenreid tosses back regularly. Tom’s portrayal is very different, he is a very good actor, and I am happy with what he has done with the character. The series is considered to be “steampunk” are you content with this label or do you not just see the series as purely as a detective/ police procedural? I don’t see it at all as “steampunk” but I am glad the “steampunk” demographic has embraced the show. I was guest speaker for one of their conventions a few years ago, and they are an enthusiastic and colourful group who love the series. The series has been running for years. Is it difficult when you are writing not to have the television series in mind? My last Murdoch Novel was published in 2008 and for now I am concentrating on my new WW2 series set in Shropshire featuring DCI Tom Tyler. Whilst you are best known for the Detective Murdoch series you have also 2 other series –The DCI Tom Tyler series and the Christine Morris series. What made you want to write a more contemporary police procedural and why set it in WWII? I grew up in post war England and always wanted to write about the war time years. What or who was the inspiration for Tom Tyler? When I met Tom Craig on the set during the filming of season one, I was in the midst of creating ideas for the new series and his portrayal of Brackenreid combine a mixture of toughness, shrewdness and tenderness which I liked. Tom is also from the UK. What is your relationship with Tom Tyler like and how do you feel about putting him in difficult situations? How have your readers reacted to this? As a writer I have to put him in difficult situations because he is a detective. Readers seem to have reacted positively to him and also the period he lives in. Are you surprised how positively the audience react to your characters and which one of them gets the most reaction? It’s always touching to experience the affection that both readers and viewers have for Murdoch. What next for Tom Tyler and is there any chance that a TV series will be made from the books? Next is No Known Grave which will be published in late October 2014 and is set during 1942 and deals with the impact that brutal atrocities perpetrated during WW2 have on a quiet country town. Tyler investigates three murders, which occur in the small rural town of Ludlow, Shropshire. I’d love to see him on TV, the offshoot of my research for the second book, Beware this Boy, became a short TV series in Canada, The US, and the UK called Bomb Girls. That book takes place in and around a munitions factory in Birmingham UK during the blitz in 1940, and I got together with Debi Drennan, who is a makeup artist on Murdoch, and whose grandmother worked in a munitions factory in Canada. So we combined my research for the book and her history with her grandmother, and we were able to sell a pitch for Bomb Girls, which lasted for two seasons and a movie of the week. I hold out hope that Tyler will come to TV and the books will be adapted, but I think there needs to be a few more published in order to create some momentum and interest by UK producers and broadcasters. Fingers and toes are crossed. Right now I have a contract for two more Tyler books, so he will live for at least 5 novels. 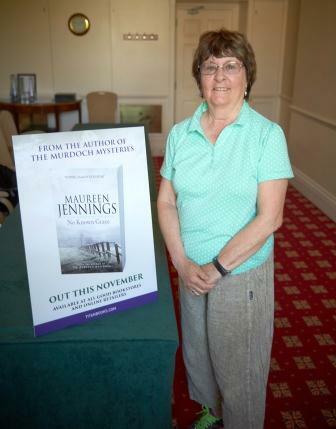 You can find more information about Maureen Jennings and her books on her website. She can also be found on Facebook. Information about the Murdoch Mysteries television series can be found on the Alibi Website. 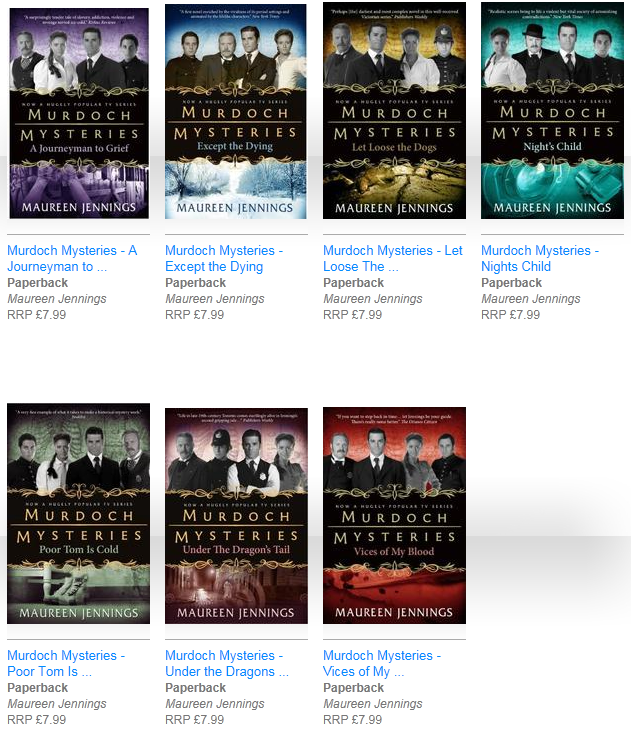 The Murdoch Mysteries Series from Titan Books. Click here for more informationin the UK.